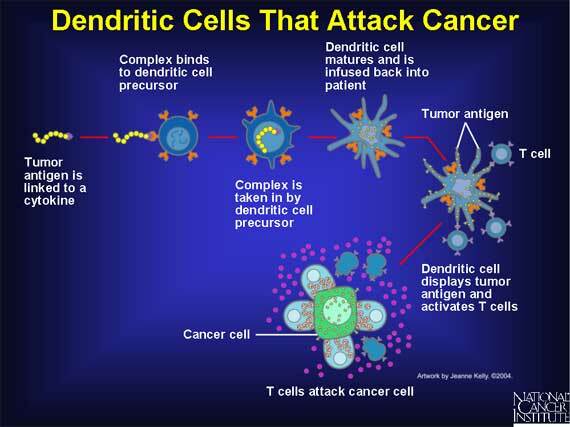 DENVAX is dendritic cell based cancer immunotherapy. Dendritic cells (DC) therapy delays cancer progression and improves patient survival. At ICT, we have treated a number cancer patients with M1 (metastatic) disease who are leading a recurrence-free quality life for many months to years. We have the experience in treating more than a thousand patients suffering from cancer in various stages of the disease. DENVAX can be given alone or in combination with the other treatment modalities. Dendritic cell therapy comes under the heading of Biological Therapy of Cancer, the fourth modality of cancer treatment after surgery, radiation and chemotherapy. DENVAX is customized treatment. It is designed to be safe and has minimal side effects. Some patients may experience fever for a day or two after taking DENVAX therapy. The components of DENVAX include patient's own mononuclear cells manipulated into cancer-fighting dendritic cells; there is no graft versus host reaction, or acute-or delayed-type hypersensitivity. To manufacture DENVAX, patient's own mononuclear cells are collected either by drawing a fresh sample of peripheral blood or by apheresis procedure. The CD14+ cells are isolated and further processed for 8 days to transform them into cancer-specific DC. These dendritic cells are then re-infused into the same patient on the 8th day of drawing blood. What are Dendritic cells and how do they kill cancer cells? Dendritic cells considered the pacemakers of the immune system, were originally identified by Steinman and his colleagues in the early seventies. They are crucial to the presentation of peptides and proteins to B and T lymphocytes and are the key antigen presenting cells. They are critical for the induction of T cell responses resulting in cell mediated immunity. It is the T cell receptors on the T lymphocytes which recognize fragments of antigens bound to molecules of the major histocompatibility complex (MHC) on the surfaces of dendritic cells (DC). The peptide binding proteins, which are of types I and II, interact with and stimulate cytotoxic T lymphocytes (CTLs) and T helper cells. The antigens from a cancer cell on entry into the APC, are processed, spliced into peptides and then re-expressed on the cell surface linked to MHC proteins. This results in generation of CTLs which recognized and destroy only cancer cells which express the antigen. The T helper cells which when activated in turn have profound immunoregulatory effects. Therefore, DC play a key role in host defenses and a crucial role in anti-cancer immune responses.